Channel @ 16...: Last weekend's races......mixed results! Last weekend we had our first ever event in Co. Waterford. It was a 2.2km swim in Baile na nGall which is in Gaeltacht na Rinne. The swim was organised by Maura Murphy and there were about 20 swimmers in attendence. I finished first in just over a half an hour and Chris Mintern from Sunday's Well wasn't far behind in second. Ned Denison was a bit later in third place, he was helped from the water by Chris and I... How embarassing!!! He proclaimed to be the real winner as he was the first "driver" home. Things are realing getting bad when you have to use your age as an excuse! This was a great first swim in Waterford and thanks to Maura for organising it. 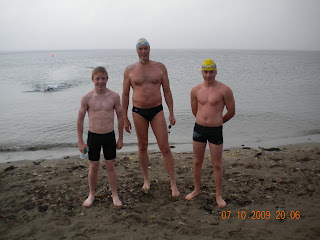 On Saturday we had Nick Mulcahy's annual swim in Caherdaniel, Co. Kerry. Due to the bad weather we couldn't do the usual swim so we had to do a shorter course just around the beach. It was a very fun and exciting event. I would like to thank Ned for knocking my goggles off in a battle less than 100m from the finish! Due to me having no goggles I went way off course and finished further back in the race. The swim was really great fun and I had a great day on Sunday surk-kayaking off the beach. Thanks as usual to Nick for another great event. Best of luck on your swim across the channell. I will pass your blog on to a few tri-athletes in Dublin and get them behind you as well. Best of luck with your Channel swim, Owen!